Community gardening in the United States encompasses a wide variety of approaches. Community gardens can function as gathering places for neighbors, promote healthier eating, and showcase art to raise ecological awareness (see Karl Linn). Other gardens resemble European "allotment" gardens, with plots where individuals and families can grow vegetables and flowers; including a number which began as "victory gardens" during World War II. Some community gardens are devoted entirely to creating ecological green space or habitat, growing flowers, educational purposes, or providing access to gardening to those who otherwise could not have a garden, such as the elderly, recent immigrants, urban dwellers, or the homeless. Some gardens are worked as community farms with no individual plots at all, similar to urban farms. Community gardens can vary in shape, size, and function, but the goal of bridging the gap between people and nature is central to their creation. These gardens weaken the divide between nature and culture, city and country, and producer and consumer. The largest community garden in the nation is reported to be Shiloh Field Community Garden in Denton, TX, measuring at 14.5 acres of land. A community garden is any piece of land gardened by a group of people. The majority of gardens in community gardening programs are collections of individual garden plots, frequently between 3 m × 3 m (9.8 ft × 9.8 ft) and 6 m × 6 m (20 ft × 20 ft). This holds true whether they are sponsored by public agencies, city departments, large non-profits, or (most commonly) a coalition of different entities and groups. Whether the garden is run as a co-op by the gardeners themselves (common in New York City, Boston and other East Coast cities) or managed by a public or non-profit agency, plot holders typically are asked to pay a modest fee each year and to abide by a set of rules. Many gardens encourage activities such as work days, fundraisers, and social gatherings. Community garden organizers typically say that "growing community" is as important as growing vegetables; or, as the American Community Gardening Association (ACGA) puts it: "In community gardening, 'community' comes first." The ACGA, a non-profit coalition founded in 1979, is the primary advocacy group for community gardening in the US and Canada. Community gardening in the United States overlaps to some extent with the related but distinct movement to encourage local food production, local farmers' markets and community supported agriculture farms (CSAs). Leases and rules prevent some, though not all, community gardeners from selling their produce commercially, although their gardens may donate fresh fruits and vegetables to local food pantries, cooperatives, and homeless members of their community. However, community gardens offer ideal sites for local farmers markets, and gardeners often seek farmers to provide space-intensive crops such as corn or potatoes. They also can hire farmers to provide services such as plowing and providing mulch and manure. In turn, small farmers can reach a wider audience and consumer base by drawing on community gardeners and their contacts. Although the two approaches are distinct, both can be effective ways to produce local food in urban areas, safeguard green space, and contribute to food security. Community gardens also increase environmental aesthetics, promote neighborhood attachment and social involvement. In an interesting variant on the practice of reclaiming bombed-out areas for community gardens (also practiced during WWII in the ghettos of Eastern Europe), in American inner-cities, community groups have reclaimed abandoned or vacant lots for garden plots. In these cases, groups have subsequently leased from a municipality that claims the property or claimed squatter's rights or a right to subsistence not currently recognized by the legal system. Two notable cases include the gardens of Manhattan's lower Eastside and the South Central Farm of Los Angeles, California. A lasting legacy of the New York gardens is 'guerrilla gardening', and the historically important "Green Guerrillas" founded by Liz Christy. In contrast, The South Central Farm was recently bulldozed in Los Angeles. Community gardens often face pressure due to economic development, rising land values, and decreased city government budgets. In some cases they have responded to the changes by forming nonprofit organizations to provide assistance and by building gardens on city park spaces and school yards. The European history of community gardening in the US dates back to the early 18th century, when Moravians created a community garden as part of the community of Bethabara, near modern Winston-Salem, North Carolina – a garden still active and open for visitors today. First Nations peoples also gardened with a community approach (Buffalo Bird Woman's Garden paints a picture of gardens among the Hidatsa), likely for generations before the arrival of waves of immigrants. During World War I and World War II, some Victory gardens were planted on public land. Academic study of American community gardening by T.J. Bassett and more recently Laura Lawson ("City Bountiful") suggests that the community gardening "movement" is best described as a series of distinct phases each with contrasting ideologies and purposes, even though all resulted in people creating gardens on public or abandoned land. The latest phase began with the alternative politics and culture and dawning ecological activism of the late 1960s. From the mid-1970s through the early 1990s, community gardening in a select number of major American cities enjoyed Federal financial support, though many programs struggled to find funding. The loss of the Federal program increased the challenge of finding funding to support programs. Funding remains a key challenge, along with secure land tenure for garden sites, finding insurance, and helping gardeners develop ways to work together smoothly. Community gardens benefit community food access by enhancing nutrition and physical activity as well as promoting the role of public health. The U.S. Department of Health and Human Services recommends eating more dark green vegetables, orange vegetables, legumes, and fruits; eating less refined grains, fat, and calories; and obtaining 60 minutes of physical activity on most days. Recent public health evaluations show community gardens as a promising approach to promote healthy behaviors. This is particularly important in establishing healthy behaviors among children given the rise of childhood obesity. One recent pilot study in Los Angeles showed a gardening and nutrition intervention improved dietary intake in children and reduced body mass index. Community gardens also benefit community food security by providing residents with safe, culturally acceptable, nutritionally adequate diet through a sustainable food system that maximizes community self-reliance and social justice. Community garden initiatives have inspired cities to enact policies for water use, improved access to produce, strengthened community building skills, and created culturally appropriate education programs that help elevate the community's collective consciousness about public health. In impoverished urban areas especially, produce harvested from community gardens provides a nutritious alternative to what Nancy Janovicek calls "the industrial diet," which consists of cheap and accessible options like fast-food chains. Professor Jill Litt and colleagues at University of Colorado School of Public Health evaluated the effects on community gardening in the Denver metro area on social environment, community building and fruit and vegetable intake. Community gardeners were more likely than home gardeners and non-gardeners to meet the national recommendations of fruit and vegetable intake. Semistructured interviews carried out by Teig et al. revealed that Denver community gardeners felt a high level of trust between members of the garden and a strong sense of community. Furthermore, gardeners were involved in community voluntary efforts and donated surplus produce to populations without access to fresh produce. Community gardens have the potential to positively impact the areas around them. If gardeners employ organic and environmentally conscious techniques, the community gardens can be a step away from chemically dependent and wasteful food systems. Gardens that produce crops and vegetables act to reduce the need for fossil-fuel intensive storage of delivery of food to local community members. As researcher Montenegro de Wit states, sustainable agriculture should not be "contained to the countryside." By bringing these techniques into communities, learning opportunities arise as well as the chance of converting land from an "emissions-source" to a "carbon sink" as Robert Biel writes. In addition to the possible environmental benefits community gardening brings, there are unintended consequences that can result from poor planning and lack of ecological consideration. For example, if most community members have to drive a considerate distance to reach their community garden or farmer's market, the benefits of locally sourced food evens out. The carbon emissions of travel to the community garden, step closer to those of commercial packaging and transportation costs. Community gardens play a part in a larger food systems movements such as food justice, food sovereignty, food security, urban farming, and more. These movements are not only happening in the United States, but transnationally in the Global North and the Global South. Agricultural activity in communities is a way of promoting self-sufficiency, as well as community empowerment and involvement. Additionally, producing food, helping the environment, and creating green spaces in cities contributes to an overall increase in happiness by helping community members accomplish fundamental human tasks such as growing food. Space in cities and communities reserved for growing vegetables and flowers promotes wellbeing, neighborliness, and the protection of nature. As the majority of the United States' farmers reach retirement age, community gardens play an active role in informing and perhaps inspiring a new generation to become involved with and passionate about growing food. Diversifying the food system with community gardens and other methods of urban agriculture will benefit the economy and create competition between product quality and value. Green spaces in cities often increase the land value of an area and contribute to gentrification. The perception of organic foods being for an affluent population, plus the perceived notion of eliteness that comes from organic-based market chains like Whole Foods and Trader Joe's work against the goals of most urban agricultural initiatives by creating exclusive spaces. Community gardens based on crop sharing, knowledge sharing, and community building help to promote access to healthy foods by creating accessible spaces. One issue faced by lower-income citizens is that they don't have the time or energy needed for becoming active in a community garden, and therefore struggle to receive the benefits they offer. Community gardens that are working for high crop yields are labor-intensive, and some community members may work multiple jobs and have little to no extra time to commit. One way that lower-income citizens can gain access to healthy food is through the SNAP program, which is increasingly being accepted at farmer's markets. Community gardens are a way for a variety of cultures to come together and create a stronger community. Focusing on creating equitable and respectful spaces where farming knowledge can be shared is crucial to creating a just food system for all community members. Communities hold specific knowledge and expertise about their local environment, and therefore, community members have the power to play a central role in the creation of their local food system. Partnerships between academic researchers, farmers/practitioners, advocates, and community members will filter knowledge of healthy foods and farming techniques throughout the community as a whole. All of these benefits will lead, in researcher Montenegro de Wit's opinion, to "a more egalitarian food system" that "will likely emerge from participation by those traditionally excluded from it."
. To find a community garden in your area, visit the communitygarden.org website. In San Francisco, community gardens are available through various public and private entities. Most community gardens in San Francisco are available through its Recreation and Park Department, which manages over 35 community gardens on City property. These are allotment gardens whereby individuals or groups volunteer to be assigned garden plots. Garden members within their respective gardens democratically organize themselves to set bylaws that are consistent with City policy. These gardeners often self-impose garden dues as a membership requirement to cover common expenses. To standardize the development and management of its community gardens, the Recreation and Park Commission adopted its Community Garden Policy in 2006. Though not plot-based, the City's Department of Public Works supports communal-style gardening on City property whereby community groups participate in the development and maintenance of public gardens. No one person is responsible for any portion of the site. One group, a community-based and resident-led volunteer group in an underserved neighborhood called Bayview Hunters Point, has created an enclosed food-producing garden on City-owned land, as well as developed many residential urban farms around privately owned homes. This group, the Quesada Gardens Initiative, is one of many organizations in the San Francisco Bay Area working at the nexus of environmental justice, health and wellness and food security, and community-building. All of the community gardens of San Francisco are listed on the San Francisco Garden Resource Organization web site with detailed directions and garden pictures of some of the gardens. There are over 100 community gardens in the Denver metro area. Gardens are located on vacant land (42%), school grounds (26%), housing facilities (15%), and other location (17%) such as churches and senior centers. Based on land tenure, community gardens in Denver are found on public land (52%), private land (24%), or owned by non-profits (16%) and Denver Urban Gardens (8%). Denver Urban Gardens (DUG), a non-profit organization that assists community members with the design, planning, and construction of neighborhood community gardens. The majority of DUG's community gardens are located in low-to-moderate income areas, and more than 20 are located at Denver public schools. DUG also partners with government and other non-profit agencies to offer gardening and nutrition education. The Westwood community partnered with the non-profit Re:Vision to create a system of community gardens in 2010 to increase healthy food access. As of 2015, they planned to expand the initiative and open a food cooperative in the neighborhood. The Aurora Mental Health Center, located in Aurora, Colorado, started a community garden in the eastern Aurora area in 2014 to improve community relations. Aurora Mental Health's community garden also provides individual horticulture therapy practices. The Aurora Mental Health Center Community Garden allows for community members to become garden leaders, helping newer members grow their plants. Jasper County Indiana supports a local community garden run by local churches. The garden has given away over half a million pounds of produce to local food shelves since it was founded in 2008. Commonwealth Gardens is a 501(c)3 organization dedicated to the formation of community gardens and school gardens in the Frankfort and Franklin County area. Commonwealth Gardens also encourages the consumption of locally grown food not only because it tastes better and takes less energy to produce, but also because it is important to support our local farmers and merchants. Commonwealth Gardens has the support of the Frankfort Department for Parks, Recreation, and Historic Sites, Kentucky Employees Credit Union, Franklin County Cooperative Extension, Pioneering Healthy Communities, The Kentucky Coffeetree Cafe, Earth Tools, Inside Out Design, and many other local businesses and organizations in the Frankfort area. In the city of Boston, Massachusetts there are a variety of local and non-profit organizations which own, promote and manage approximately 180 community gardens throughout the city. These organizations include the Boston Natural Areas Network (BNAN), Boston Nature Center of the Massachusetts Audubon Society, Boston Parks and Recreation Department, Boston Urban Gardeners (BUG), MA Department of Conservation and Recreation, Dorchester Gardenlands Preserve, ReVision House, and the South End Lower Roxbury Open Space Land Trust. In 2002, the volunteer-run Boston Community Garden Council was formed as a means of facilitating communication and cooperation between these organizations along with individual gardeners in Boston. Community gardens located in Detroit include the Earthworks Farm, the North Cass Community Garden, and the Woodbridge Community Garden. Bell Demonstration and Community Garden plays an integral role in Gateway Greening's ongoing community education efforts, with 20 demonstration beds, a community chicken coop, compost bins, extensive ornamental beds, and a sheltered outdoor classroom. This garden also houses additional beds which belong to the ever-active Bell Community Gardeners. St. Louis is home to Gateway Greening, a unique non-profit organization that works with interested neighborhoods to transform vacant lots into vibrant community gardens. Since 1984, Gateway Greening has grown to support more than 250 community, school and youth gardens throughout St. Louis City and County. This support is provided through the creation of a grant processes which awards much needed materials, tools, and other valuable resources to new and existing community gardens. Additionally, Gateway Greening provides a rich schedule of ongoing community education opportunities at the Bell Community and Demonstration Garden, network of Community Resource Gardens, and the Gateway Greening Urban Farm, a 2.5 acre urban farm located in downtown St. Louis. Although Gateway Greening is a major proponent of community gardening in St. Louis, it is by no means the only group to create or support STL Urban Agriculture. Community gardening and urban agriculture has taken off in St. Louis, Missouri, in recent years in part thanks to the Garden Lease Program which allows residents to lease LRA land for a period of 5 years. Community gardens in New Jersey include the South Orange Community Garden. In New York City, there are nearly 600 community gardens located in all five boroughs that are supported by GreenThumb – the community gardening division of NYC Parks. GreenThumb provides technical, material, operational, organizational and property management support to community gardens and another 650 school gardens located throughout the City. Begun in 1978, it is the largest and oldest program of its kind in the United States. In Salt Lake City, community gardens are available through the non-profit organization Wasatch Community Gardens. On May 16, 2009 Wasatch Community Gardens, in collaborated with The Redevelopment Agency of Salt Lake City (RAD), launched the first People's Portable Garden in Salt Lake City. The garden is designed to stimulate growth and revitalize different areas of the city. Salt Lake City put $48,000 into the People’s Portable Garden on 900 South. The People's Portable Garden is located at 900 S 200 W, Salt Lake City. The Seattle P-Patch program for community garden plots began in the early 70s during an economic downturn known locally as the "Boeing Bust" which had resulted in many people without work or money. Darlyn Rundberg Del Boca, a University of Washington student, saw an opportunity to promote children's gardening with a focus on growing for the local Neighbors in Need food bank program, and with the help of a Seattle Councilmember obtained permission to use part of the Picardo family's truck garden in northeast Seattle with the City of Seattle renting the land for the cost of its real estate taxes. The first garden consisted of a large central garden plot planted by children from the nearby elementary school and their parents; families who volunteered to help were offered smaller individual plots around the perimeter of the central plot. The City subsequently purchased the Picardo farm, and the program of renting individual garden plots arising from the first efforts was named 'P-Patch' in honor of the Picardo family's contribution. The P-Patch program continued to grow and currently consists of 1900 plots in 68 locations with a total of 23 acres (93,000 m2) of land, with additions planned each year, and the tradition of growing for local food banks resulted in 12.3 tons of food donated in 2008. In 2010 the city of Olympia adopted a plan to create up to six community gardens. Currently the city has two gardens: one at Sunrise park and the Yauger Community Garden Project. There are also many private community gardens such Wendell Berry in the Bigelow neighborhood. ^ a b c d Biel, Robert. "Built systems, biomimicry and urban food-growing". Sustainable Food Systems. UCL Press. pp. 90–107. ^ a b c d Certomà, Chiara (2015). "Critical Urban Gardening". RCC Perspectives, Think Global, Eat Local: Exploring Foodways. No.1: 13–18. ^ Wylie, Melissa (April 4, 2014). "Largest community garden in U.S. feeds the hungry in Denton". The Dallas Morning News. 508 Young Street Dallas, Texas 75202 United States: James M. Moroney III. Retrieved 2 August 2015. ^ "LA's South Central Farm Shut Down and Bulldozed". ^ Hess, David J. (2009). Localist Movements in a Global Economy: Sustainability, Justice, and Urban Development in the United States. Cambridge, MA: MIT Press. ISBN 978-0-262-01264-5. ^ Hess, David J. "Case Studies of Community Gardens". Archived from the original on 2013-01-30. Retrieved 22 July 2012. ^ Guptill, Amy E. (2012). Food and Society: Principles and Paradoxes. Polity Press. p. 13. ^ Alkon, A. H. Cultivating food justice: Race, class, and sustainability. MIT Press. ^ Guptill, Amy. Food and Society. Polity. ^ a b c d Janovicek, Nancy (2016). "Seeds of Knowledge From Back-to-the-Land to Urban Gardening". RCC Perspectives, ENVIRONMENTAL KNOWLEDGE, ENVIRONMENTALPOLITICS: Case Studies from Canada and Western Europe. No. 4: 33–40. ^ a b c d Montenegro de Wit, Maywa (2014). "A Lighthouse for Urban Agriculture University, Community, and Redefining Expertise in the Food System". Gastronomica. 14 (1): 9–22. ^ Cleveland, David (2015). "How does food localization contribute to food system sustainability?". Frontiers in Ecology and the Environment. 13 (8): 410–411. ^ "2012 Census Highlights, Farm Demographics". USDA Census of Agriculture. May 2014. Retrieved 15 Apr 2018. ^ a b Cohen, B. R. (Spring 2014). "Don't Mono-crop the Movement Toward a Cultural Ecology of Local Food". Gastronomica. 14 (1): 5–8. ^ "Gardens, - American Community Garden Association". American Community Garden Association. ^ "Community Gardens". sfenvironment.org – Our Home. Our City. Our Planet. 2012-06-27. Retrieved 2017-10-02. ^ "Community Gardens Program | San Francisco Recreation and Park". sfrecpark.org. Retrieved 2017-10-02. ^ "Food gardens a growing trend". 10 June 2008. ^ "Education Internship - Denver Urban Gardens". 7 February 2011. ^ Arias, Richard. "Case Studies of Community Gardens: Denver Urban Gardens" (PDF). www.davidjhes.org. Archived from the original (PDF) on 2009-10-13. Retrieved 22 July 2012. ^ "Westwood Food Co-op". Re:Vision. ^ Allen, John. "KV community Garden". KV Community Garden. Retrieved October 8, 2014. ^ Dowty, Rachel. "Case Studies of Community Gardens: Boston Community Gardens" (PDF). www.davidjhess.org. Archived from the original (PDF) on 2009-10-13. Retrieved 22 July 2012. ^ "Capuchin Soup Kitchen - Earthworks Urban Farm". www.cskdetroit.org. ^ "Home - Gateway Greening". Gateway Greening. ^ "Bell Community and Demonstration Garden – St. Louis – Local Business | Facebook". www.facebook.com. Retrieved 2016-05-02. ^ "Garden Lease Program". stlouis-mo.gov. ^ Theresa Burns. Garden State: Building Community and a Garden. New York Times, April 22, 2010. ^ "NYC Parks GreenThumb". www.greenthumbnyc.org. 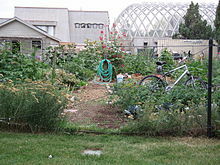 ^ "Wasatch Community Gardens". 16 September 2009. Archived from the original on 16 September 2009. ^ McDonough, Ted. "Public Nuisance". ^ Hess, David J. "Case Studies of Community Gardens: Seattle's P Patches" (PDF). www.davidjhess.org. Archived from the original (PDF) on 2009-10-13. Retrieved 22 July 2012. Sam Bass Warner. To Dwell Is to Garden: A History of Boston's Community Gardens. Boston : Northeastern University Press, 1987. Laura Lawson, (2005). City Bountiful: A Century of Community Gardening in America. Berkeley: University of California Press. ISBN 0-520-24343-9. Wikimedia Commons has media related to Community gardens in the United States. List of San Francisco Community Gardens. List maintained by the San Francisco Garden Resource Organization.